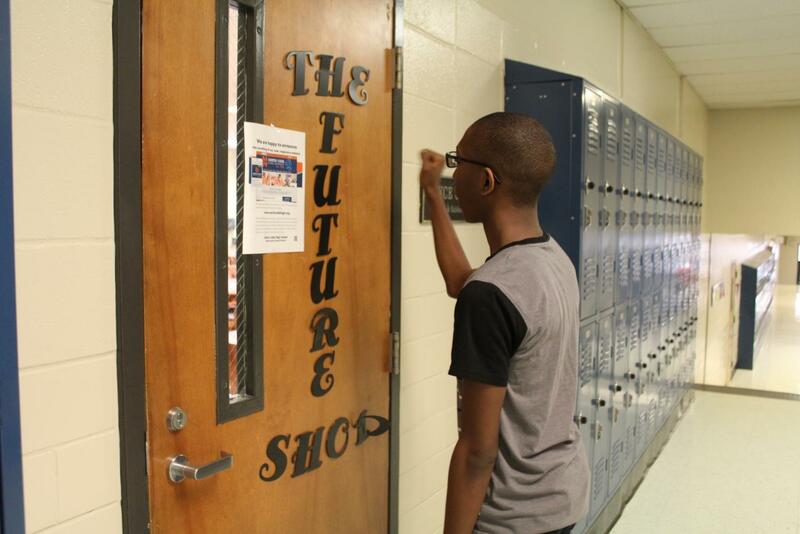 A student knocks on the door of NC’s Future Shop, host to innumerable college and career resources and quite frequently to visiting admissions staff. The college application process can generate significant stress for seniors, and students frequently worry whether their scores, grades, and achievements will earn them a place at the schools they hope to attend. “I always feel like you determine what college you want to go to depending on whether or not you know what your standing is,” senior Ngozi Ozor said. As fall rolls inexorably into winter, a great deal about the world surrounding NC begins to change. The temperature drops (a welcome change for most Georgians); the winds pick up; deciduous trees lose their foliage; students begin to study intently to rescue their precariously situated GPAs. For NC’s college-bound seniors, though, perhaps the most important change of all involves the college application and decision process. From speculating, largely idly, on vague ideas of their post-high-school goals throughout the past three years of high school, seniors find themselves thrust into a brave new world. They find their days (and frequently nights) consumed by essays and applications and test scores and scholarships, and the prospect of heading into the next stage of their existence becomes quite suddenly all too real. Even for popular schools such as Kennesaw State University, the University of Georgia, Georgia State University, Georgia Southern University, and the Georgia Institute of Technology (a number of which count among the most sighted institutions on NC’s MeritPages alumni achievement website), the ordeal can seem unflaggingly daunting from start to finish, especially when one simultaneously must deal with the academic and social stresses of senior year. “It’s more difficult than it needs to be. It’s really tedious, how you have to put every single tiny detail in order to be admitted to a college,” senior Nico Eastep said. The sheer amount of information required by colleges, especially public schools, can also complicate the process. “It’s tedious, it’s detailed, and I‘ve had to call my parents a lot to ask them what year they graduated from what college and what specific degree they got,” senior Joanna Shephard said. Moreover, early application deadlines, promoted as entirely optional, nonetheless serve as the qualifying deadlines for various scholarships and other programs. Hence, students frequently feel pressured to submit applications as early as possible. “Definitely start your applications early. I would recommend doing something in the summer, just to start preparing,” senior Reed Walker said. Applying to the colleges one hopes to attend, though, only forms the tip of the proverbial iceberg. Students frequently also apply for additional scholarships, essay contests, and financial aid from a wide variety of outside sources, hoping to cut the prodigious cost of attending a university but also further complicating and expanding the admissions process. “I’m doing this program called QuestBridge, which is where you apply to a program or coalition, and if you’re a finalist, then you can have the opportunity to match with specific schools after you rank them from one to twelve. If they accept you as one of their matches, then you get to go to college for free for four years. It’s a way to apply to colleges early without fees, and it’s supposed to be for lower-income areas, kids that can’t really afford a ton of application fees for the top colleges,” Walker said. When it comes to selecting the specific schools to which one applies, seniors consider a wide and often idiosyncratic array of factors. “[I’m looking at] UGA, Georgetown, probably Emory. I’m kind of a legacy for Emory, because my mom went there, and I have friends who went to Georgetown. And pretty much everyone I know has been at UGA at some point in their life for something,” Shephard said. 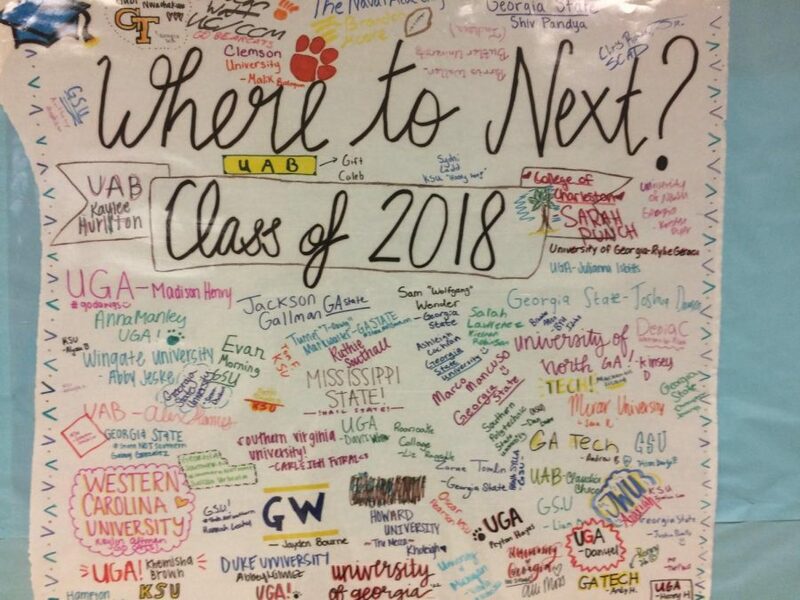 Last year’s NC Magnet seniors signed a large sheet of paper listing their college destinations that now hangs in the hallway outside the magnet lounge. Perennial favorites such as the University of Georgia, Georgia State University, and Georgia Tech sit alongside institutions farther afield such as North Carolina’s Duke University, Virginia’s Roanoke College, the United States Naval Academy, and the University of Maryland. Students’ planned careers can heavily influence their final college list. Different colleges naturally focus on different specialties, and students hope to gain admission to a school whose priorities align with their own. For future poets and writers, the University of Iowa may well constitute a dream school; meanwhile, aspiring aerospace engineers might wish to attend Embry-Riddle Aeronautical University, and Brown University or Emory University might take pride of place as the ultimate goal for would-be doctors. “I want to do pre-med in college and hopefully end up one day in medical school, and whenever I go to college counseling sessions for pre-med they always talk a lot about not accumulating a lot of debt from your undergrad. So a big thing to me is what colleges can offer me in scholarships during my undergraduate life,” Shephard said. Nonetheless and despite the considerable struggles of applying to college, seniors suggest that the actual act of earning (or not earning) admission to one’s school of choice may not in fact constitute quite so difficult a task as some claim. “I know that a lot of people will say that there’s no point in trying for an Ivy League, because they feel like they aren’t qualified or they won’t get the test scores that they need to get in, so I feel like that really does affect the college selection process,” senior Ngozi Ozor said. Walker argues that such a viewpoint fails to take the role of chance into account. Schools’ score cutoffs may in fact prove less “hard” than they seem; even Yale goes so far as to claim on its website that it employs no cutoffs whatsoever. Moreover, to set one’s sights lower on the basis of a few points’ difference on a standardized test may merely constitute the unnecessary sacrifice of a genuinely remarkable opportunity. “Even if you feel like your qualifications are not good enough to get in that college, still apply. You can get accepted into MIT and then not get accepted into a local university in your state. It just all depends on that specific admission policy,” Walker said. Complex, tedious, and frustrating though it might become, applying to college remains an essential element of the life of the American high school senior. One thing makes itself quite clear: as much as students labor, stress, and panic daily and nightly over their applications, they still seem to view the prospect of a college education as ultimately worth the struggle.